A company known for manufacturing special edition USB flash drives fashioned into nostalgic characters from series like G.I. Joe and Looney Tunes, EMTEC is continuing the streak with a worldwide release of a new line of Custom Shaped USB drives. This time around the flash drives are dedicated to the popular French comic Asterix. Asterix is a comic that has had a prominent mark on the childhood of many of the French. That doesn’t mean, however, that the fondness is only contained within the borders of France. Asterix’s fame has spread throughout the world and has led to two animated films based on the comic, one of them coming up in 2014. 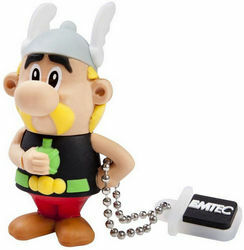 In honor of such an influential comic series, EMTEC released its new collection of Asterix USB flash drives. The USB line consists of four character designs, Asterix, Obelix, Centurion, and Abraracourcix. Available in two storage capacities, 4 GB and 8 GB, the flash drives are USB 2.0 and, therefore, compatible with both USB 1.1 and USB 2.0 computer ports. They are constructed from high-quality rubber, which has been shaped and painted into the famed Asterix characters, making the storage and transfer of data a nostalgic trip back to childhood for the owner. The flash drives are also outfitted with a chain that acts as a security measure; it makes sure, along with a cap holder, that you won’t lose the cap that comes with the USB. Attach it to your keychain or to another chain and wear it as a necklace for extra assurance, if you wish. The family of flash drives has a fairly widespread OS compatibility. A majority of Mac, Windows, and Linux computers should be able to read the USBs. According to the theoretical data from EMTEC, the Asterix flash drives should able to reach read speeds of up to 18 MB/s and write speeds of up to 8 MB/s. They should run you just about $20 a pop, and each unit is backed up by EMTEC’s five-year warranty. If you want a piece of this special edition line of USB flash drives, you can get your very own Asterix character through selected EMTEC retailers. This entry was posted in Custom Shaped USBs, EMTEC and tagged Asterix, Custom Shaped Flash Drive, Custom USB Drive, EMTEC. Bookmark the permalink.